This 46,000 square foot dealership sits on five acres and was the first new Hyundai facility under the new brand image program that included the use of 3 wave composite panels. This 100,000 square foot dealership was completed with all high-end finishes. It sits on 8-acres and includes a pre-cast parking structure within the building, rooftop parking for 160 vehicles, used car and Fiat dealerships, and a hair salon for guests. 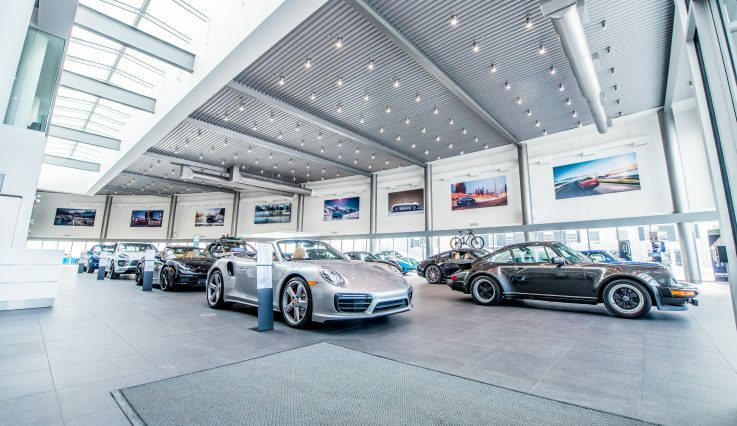 This show-stopping, iconic dealership is 62,000 square feet on 3 acres and adheres to Porsche’s strict brand image program. This dealership’s unique layout includes a lower level detailing centre and vehicle showroom, both accessible via two elevators. The dealership’s 3.6 acres of raw land was graded and 11 vehicle protection tents were completed, along with irrigation and landscaping to city requirements. This 95,000 square foot dealership is on 8 acres. Every element of the development meets the dynamic Mercedes-Benz brand program but landscape and flow were considered throughout the build to ensure this luxurious space performed. Meeting and exceeding all of the brand’s unique image standards, Lexus of Royal Oak is a 45,000 square foot dealership on 3.5 acres. The full-service dealership is complete with unique features including a nail salon and a barista. Developed on 52,000 square feet, we completed a series of retractable hail nets to protect up to 175 vehicles.